I'm back, baby! And actually updating you on my little Fetus ("Are you in there little fetus? In nine months will you come greet us? I will buy you some adidas!"). Here's the stats, yo. Weight Gain: SEVEN pounds total! I know!! I'm getting the ball rolling here, folks. I think the The Baby is going through some crazy growth spurt of late because I've been STARVING all the time and eating like you wouldn't believe. In fact, I am currently eating a piece of cheesecake for breakfast. Good times. Aches & Pains: The nausea is gone!! I haven't had to take any medicine at all this week, for which I am eternally grateful. My back is still a little achy, but I'm just getting to that stage so it's pretty expected. 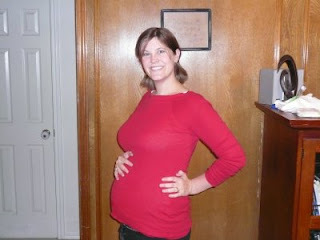 All in all, I'm feeling pretty good and I'm in a good stretch of pregnancy. Cravings: Sweet Mother, the cravings. The last week the cravings have hit at 9:30pm - 10:00pm and they've hit bad. In just this week, one night I ran to Kroger and bought brownie mix, one night I made brownie mix, one night Dave got me a milkshake, and last night I ran out to Super Target and bought a slice of chocolate cake and the slice of cheesecake I'm currently eating. It's a miracle I haven't exploded from sheer volume. Here's The Gator in all her glory. She's sitting low, low, low and a little to the right. She's kicking like a little thumping rabbit, and while Dave has felt/seen her once, so far she seems to be copying her older sister and going completely still whenever anyone looks/feels my stomach. So, there you have it everyone! An update on The Unsinkable and her Gator Baby. I hope you all have a great day! Woohoo for you! You (both) look fabulous, despite the cheesecake and brownie mix cravings. Congratualtions on being past teh half-way stage! Yay! Love the name! And, the nickname is great! So glad that the sick is gone. That's definitely the worst. Love the name (and the nickname :)), and you look fantastic!! Can't wait to meet her. I know I've never commented here, but I really like your blog! Also, congratulations! My best friend is called Alison Grace, but I've always called her Allie and it's a GREAT name!